Bring Students Together to Tackle World Problems Click Here to Visit Website Online spot to get involved in real-world problem solving using science, technology, engineering and math (STEM) skills. The Global STEM Alliance in an effort to bring students from across the globe together to solve world problems. The Alliance will start by having one spot online for students to get involved with STEM projects, even help them find STEM internships. STEM Alive: PBS Learning provides a series of educator training videos focused on STEM topics. Each video explores a lesson plan based on the teacher-tested, learner-centered RAFT Idea Sheets. The Concord Consorium Excellent STEM activities Help your students learn with hundreds of interactive, research-based resources covering a huge variety of science, engineering, and math topics. Stand Up for STEM students learn about discrepant events using two glass jars, two chunks of wax, duct tape, tap water and rubbing alcohol? Find out in Stand Up for STEM lesson series for grades 3-5. These four lessons will help students have fun and see themselves in STEM fields. ﻿The STEMAZing Projec﻿t www.STEMAZing.org. The STEMAZing Project identifies high quality STEM resources and provides professional development to PreK through 12th grade educators. STEMAZing.org houses The STEMAZing Project’s collection of educator-to-educator recommended resources for PreK through 12th grade educators. Connected Science Learning from NSTA is a peer-reviewed online journal that highlights STEM education experiences that bridge the gap between in-school and out-of-school settings. It features articles about highly effective programs and shares research that connects preK–12 STEM learning in schools and out-of-school settings, specifically highlighting effective mechanisms for collaboration. 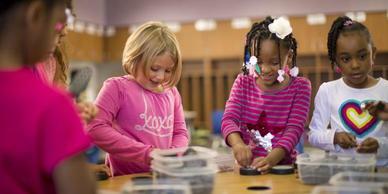 STEM to STEAM - This organization is an advocate for STEAM education. It contains resources and information that allows educators to promote the Arts in STEM education (STEAM). An objective of the STEAM movement is to transform research policy with a goal place Art + Design at the center of STEM. Blendspace – This tool is one of the easiest ways to blend the classroom with digital content. Teachers can collect and organize web resources in one place and share with just one link. It is also possible to assess students and measure student understanding with built-in quizzes. There are even tools to monitor student progress while adapting to individual needs in real-time. The easy drag and drop interface allows a STEM lesson to be completed in 5 minutes! STEAM Unit 6 lessons to introduce STEAM with design process, book lists, and challenges. Wolframalpha - Not your typical search engine. This is a computational search engine that is a plus for any STEM educator. It is easy to use and its ability to find data is just plain fun! Nuskool This is a site that uses pop culture as teaching moments for students. Tailored to grades 6th-12th students learn a variety of subjects such as: Math, Science, English, etc through educational lessons based on the different elements of pop culture (video games, sports, films, etc.). Stem Seeds a teacher-created website and podcast / webcast about STEM lesson ideas, links, and connections. Join technology columnist David Pogue as he delves hands-first into the field of materials science. Find out which materials he thinks will play a role in shaping the future. Sparticl is a site for finding STEM based resources. There are over 2500 curated resources on a wide variety of subjects. Best of all a user can login and curate their own lists of resources and even vote/comment on them. Sally Ride Science STEM Central website combines social tools with user-generated links to create a storehouse of reliable resources that are “reviewed, rated and ready-to-use.” This free web resource is designed for educators and students interested in science, technology, engineering and math (STEM) topics andcareers. The site offers thousands of links to articles, videos, maps, animations and other media specifically focused on the needs of educators and students. Users searching STEM Central may apply a wide variety of filters to search by topic, grade level and media type. Learning Reviews - The PBL portion of this site provides some outstanding links to web resources that cover science, math, engineering and technology. You will find grade levels along with the number of resources supplied. A STEM Diet of Awesome Snacks that Scaffolds into PBL… Better Then Dessert! Exploratorium Snack Home Page . gr. 8 - 12You can also explore them by subject, supplies, or an A-Z listing. Think of a Snack as a wonderful way to increase your students' appetite for STEM inquiry, learning, and exploration. These Snacks are bite size opportunities to bring science alive in small but engaging size. The Jason Project – set of free digital curricula filled with multi-media, simulations, readings, class activities, and projects! Check out that roller coaster simulation just to name one! Design Squad from PBS Kids features a great collection of hands-on activities for elementary and middle school students. The activities are designed to help students explore engineering concepts. The collection of activities is divided into ten categories. The categories are technology, structures, sports, space, sound, simple machines, health, green, energy, and electricity. Each activity contains a materials list and directions. Some of the activities also have demonstration videos.